Proxies allow you to cache content so you don’t have to reload it twice, make it seem like you’re coming from somewhere else, create content scanners against things like viruses so you don’t get infected, and other stuff. They’ll speed up your Internet with the cached content so it might seem faster if you go to the same page frequently. Now you have to edit the main config file and add the av update username and password you got with your order. NOTE: DON’T delete the leading #’s at the beginning of these lines, they’re not really used like commented lines like normal, well some are, but the ones you want to change still need the pound sign for some reason. >: /etc/init.d/esets restart [....] Restarting ESET Security: esets_daemonerror[21d00000]: Cannot initialize scanner: License not found failed! If you don’t see anything, it’s not running. Stop and fix that before you continue. [ ok ] Restarting ESET Security: esets_daemon. /etc/init.d/esets restart [ ok ] Restarting ESET Security: esets_daemon. 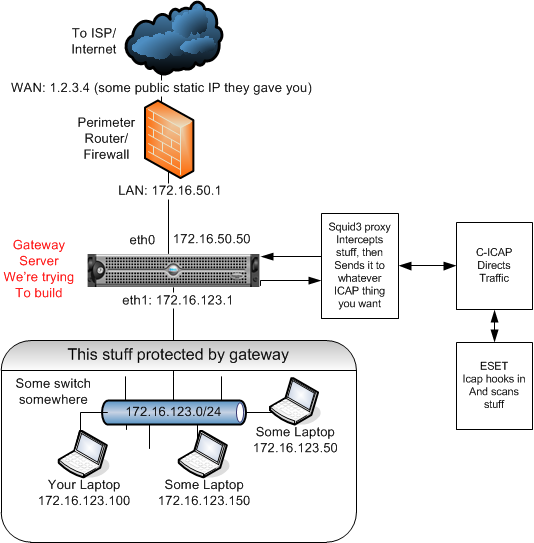 Now we set up Squid3 proxy with C-ICAP to send traffic to our ESET gateway we got running. First we set up Squid3 basic stuff, like what networks to listen to, and how to send stuff to C-ICAP so it can go ask the ESET gateway if it’s malicious. [ ok ] Restarting c-icap (via systemctl): c-icap.service. /etc/init.d/c-icap restart [ ok ] Restarting c-icap (via systemctl): c-icap.service. Okay, now go to a laptop that’s on the 172.16.123.0/24 somewhere and see if you can get to the Internet by opening up a browser and going to a NON-SSL webpage that you haven’t visited recently (so it won’t be cached). If you can, it’s working. If not, fix it before proceeding, because your traffic is busted, and not routing through the your new gateway. Virus signature database has been updated successfully.